Moving house can be a stressful experience, but nothing keeps your mind at ease like being well prepared. To make sure that your move runs smoothly, we have made a moving checklist for things you should do before and after moving into your new house. Making a moving checklist is an important part of a moving process. Getting familiar with your new neighborhood will definitely pay off in the long run. It will come in handy once you start living there if you already know the roads and the shortcuts. You should also try to locate the nearest convenience stores, parks, restaurants, schools, banks, bus stops and any other locations relevant to you. Whether you choose a DIY move or a moving company, you should put aside a certain amount of money to cover your moving expenses. Choosing to do a DIY move means that you will save money, but you will have to struggle with moving your furniture without professional help or equipment. Depending on whether you are moving to another town or just moving to another neighborhood, you should acquire from 1,000$ up to 5,000$ if you choose to hire a moving company. Don’t forget to notify your bank about your address change. You should also notify any service companies such as gardening, cleaning, newspapers delivery, car maintaining, etc. Consider changing the address of any deliveries you are expecting. When packing, you should put aside any items you haven’t used for the past 6 months, and don’t plan on using for the next 6 months. This includes old toys, furniture, electronic devices, kitchen appliances, plants, cutlery and crockery. 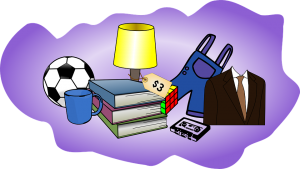 You should sell those items in a yard sale if they are still usable. You can also donate any clothing items you don’t wear, or the clothes that are too small for your children. You can bring any non-perishable food to your new house, but you should plan on finishing the food in your freezer or asking a friend to store it in their freezer until you move. Also, go through your other food storage, and throw away any food that has been stored for too long and you don’t plan on eating it. You can also take your extra food to a local soup kitchen or animal shelter. When moving house, things will inevitably get lost. You need to make sure to keep important documents such as IDs, passports, birth certificates, wills and house deeds in a box or a file keeper. You should also put all your jewelry and cash in one place. The first thing to check is the locks and whether your keys are compatible with them. You might also consider changing the locks if the house had any former residents. Check if your windows and any other possible entrances are secured. Inspect your new space for any pests in the kitchen, bathroom, basement and attic. Consider checking the smoke alarms as well, power plugs and sockets, taps, etc. or hire an electrician and a plumber to do that work for you. Before getting your furniture inside the house, make sure that the floors and other surfaces are clean. If you do it the other way around, it will take more time. Once your furniture is in place, you can start unpacking your clothes, hygiene products, food, electronic devices, books, and finally your decorative items. You should start with the most essential items. To make unpacking less stressful and chaotic, you should go room by room. Once you’re done unpacking, place your valuables and important documents in a safe place. Check for broken or lost items during transport. When placing your furniture, you should consider the way you position it if you have kids or pets. 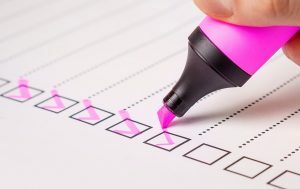 If you had experience with child/pet-proofing your previous home, you should make a moving checklist for this task too. Make sure to remove any possibly dangerous objects from the floor and low furniture. This includes putting outlet covers over electrical outlets. If your house has stairs, consider putting baby/pet gates. If you have a dog, check your backyard for any holes in the fence or dangerous items. Supposed you have a garden, you might want to keep your dog out of it by putting a fence around the garden. Don’t forget to inspect your yard for moles, skunks and snakes. Go to a local supermarket and restock on perishable foods such as dairy products, eggs, bread and meat. If an essential item was lost or broken, make sure to buy a new one. It’s always a good idea to make a checklist of items you need to buy before you leave the house. Find out when the trash pickup days are and what time the newspapers and the mail get delivered. If there is a bus line passing nearby, make sure to acquire the bus timetable. Ask around for any local festivities and events. Find good local restaurants, cafes and bars, as well as food delivery services. Find new service companies for gardening, cleaning and car maintaining. Getting in sync with your neighbors and similar tasks are important parts of making a good moving checklist. One of the most important things is to get to know the people who live right next to you. They can be of great help when it comes to getting familiar with the streets, shortcuts, and local stores and services as they can give you advice based on their experience. We hope our moving checklist helps you relocate quickly and hassle-free, so – good luck!